A breakout teen author explores the true meaning of popularity and how to survive middle school in this hysterically funny, touchingly honest contemporary memoir. 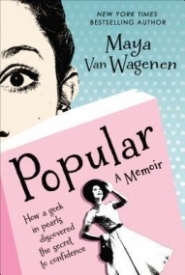 Can curlers, girdles, Vaseline, and a strand of pearls help a shy girl become popular? Maya Van Wagenen is about to find out. Stuck near the bottom of the social ladder at “pretty much the lowest level of people at school who aren’t paid to be here,” Maya has never been popular. But before starting eighth grade, she decides to begin a unique social experiment: spend the school year following a 1950s popularity guide, written by former teen model Betty Cornell. The real-life results are hilarious, painful, and filled with unexpected surprises. Told with humor and grace, Maya’s journey offers readers of all ages a thoroughly contemporary example of kindness and self-confidence, along with a better understanding of what it means to be popular. Most so-called memoirs can come off dry or not too interesting. POPULAR isn't that book. Rather it's an enchanting journey of a fifteen-year-old as she uses a copy of a 1950s Popularity Guide for her eighth grade school year. What worked: I totally loved the voice of Mayra! Heart felt advice is throughout this book! Her journal-like entries start in September with her tackling a chapter per month from a dusty Betty Cornell's Teen-Age Popularity Guide her family finds after cleaning out her Dad's office. Mayra brushes it off at first but her mother gives her an idea--why not follow the advice and write about it? From there Mayra starts her experiment. She breaks down the table of contents by month and hopes by the end of eighth grade, she'll know what being popular not only is but feels like. Some things she tackles are figure and skin problems to clothes and what to wear. There are some hilarious accounts on how she translates some 1950s advice into something a teen now would do. Some of my favorites had to be having her mother put her hair up in rag curls and the end result. Also the girdle experience is totally hilarious! All in all though one thing Mayra does is find her unique voice and something that transfers her from a shy teen into one with confidence. And isn't that what being popular is all about? Mixed throughout are Mayra's own popularity tips that I know will resonate with teens. The photos of Mayra show her experiment and also a glimpse of her family and the real Betty Cornell who she finally met. Mayra middle school is located by the border and shows some realistic portrayals of the town. Some might think it's too harsh but I love that she doesn't dwell on the negative but rather shows us some positive things. One thing I totally related with as an older reader had to be how Mayra is a quarter Latina in a school that is over 90% Latino, so she doesn't have enough Latina blood to be considered that. That's been my own experience. Enchanting journey of a real teen's popularity experiment that will have you laugh, smile, and cheer her on as she finds the real key to popularity. A must read!